Penguins are hot stuff these days. “March of the Penguins” and “Happy Feet” both let their creators buy solid gold toilet seats with the amount of money they brought in from the box office, and the next penguin film, “Surf’s Up”, looks like its going to do the same. Why penguins are so successful these days is a mystery to me; they are cute little guys, but so are Gorillas, in certain situations. And Pandas. Where’s a gorilla or Panda movie, I ask you? 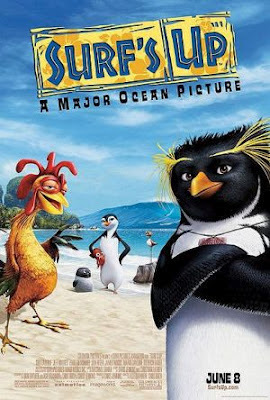 Anyway, “Surf’s Up” is a fun movie about penguins, more fun then the recent Happy Feet or educational March of the Penguins, but its not as good a film. It lacks the real, strong emotion that Happy Feet had at all times, but makes up for it in laughs and entertainment value. This is an animated movie to take the whole family to; the kids, the teens, the adults, the grandparents. It has something in it for all ages, be it the slapstick for the little ones, the Chicken version of Napoleon Dynamite (actually voiced by Jon Heder) for the teens, or the various refrences to 70’s entertainment for the adults, everyone should have a good time with the film. Essentially a fictional documentary about a penguin surfing competition, “Surf’s Up” finds a camera crew (who the audience never sees) following the adventure of Cody Maverick, a young hotshot from Shiverpool, Antarctica, who lives to ride the waves. He goes to Pen Guin Island to participate in the Big Z Memorial Surfing competition, where he meets his new best friend Chicken Joe, falls for a kind lifeguard, finds a surfing mentor, and learns important lessons about being a winner. “Surf’s Up” is basically one big cliché; except for the whole penguins-on-surf-boards thing, you’ve seen this movie many times before. The lessons are old school morals, about winning, losing, and just enjoying the ride, and the plot is extremely predictable, as it follows the path of most animated fare, but it executes its clichés extremely well, and in the end feels original in its own, strange way. The original feel really comes from the film being a “documentary;” it’s a great idea that manages to keep the film feeling fresh and new, while balancing its old as time morals at the same time. The voice acting and dialogue is great, and paired with the amazing animation creates fun and memorable characters. Like I mentioned earlier, Jon Heder voices Chicken Joe, the chicken who has no clue what’s going on. He’s the best character; if you don’t laugh at Chicken Joe’s antics, you don’t have a soul. Shia LaBeouf voices hotshot Cody, and does his tried and true self-esteem-filled teenager thing. Jeff Bridges wonderfully breaths vocal life into Cody’s mentor, Big Z, and this character really makes all the films morals and lessons work. The voice acting is solid across the board. The animation is stunning, or it would be if there weren’t a million equally beautiful CGI films coming out a year. Despite the recent flood of CGI films, “Surf’s Up” still manages to amaze in some scenes with its animation, it’s just that we’ve come to expect this level of animation from movies nowadays. The animators do have some cool tricks up their sleeves that adds to the entertainment of the film, though. They treat the computer’s camera as a real camera, so whenever water splashes the way of the viewer, you see drops of water sliding down the screen. Very cool. Finally, the film has a unique musical soundtrack; the score is obviously inspired by the piano and strings heavy score for “March of the Penguins.” As such, the score is about 10 times as dramatic as the film, but oddly enough, it manages to enhance the film quite a bit. So, in the end, this isn’t a classic, and it probably won’t win any Oscars. It is, however, a fun and, in its own way, original little movie that has something for everyone. Catch it in the theater if you can, and if not, definitely pick it up on DVD; it’s easily worth a watch.